^ Callaway, E. (8 June 2016). 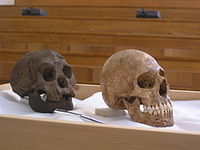 "'Hobbit' relatives found after ten-year hunt". Nature. 534 (7606): 164–165. Bibcode:2016Natur.534Q.164C. doi:10.1038/534164a. PMID 27279191. ^ Brumm, A.; van den Bergh, G. D.; Storey, M.; Kurniawan, I.; Alloway, B. V.; Setiawan, R.; Setiyabudi, E.; Grün, R.; Moore, M. W.; Yurnaldi, D.; Puspaningrum, M. R.; Wibowo, U. P.; Insani, H.; Sutisna, I.; Westgate, J. A.; Pearce, N. J. G.; Duval, M.; Meijer, H. J. M.; Aziz, F.; Sutikna, T.; van der Kaars, S.; Flude, S.; Morwood, M. J. (8 June 2016). 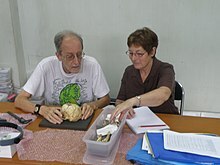 "Age and context of the oldest known hominin fossils from Flores". Nature. 534 (7606): 249–253. Bibcode:2016Natur.534..249B. doi:10.1038/nature17663. PMID 27279222. ^ a b van den Bergh, G. D.; Kaifu, Y.; Kurniawan, I.; Kono, R. T.; Brumm, A.; Setiyabudi, E.; Aziz, F.; Morwood, M. J. (8 June 2016). 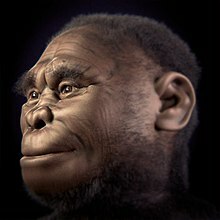 "Homo floresiensis-like fossils from the early Middle Pleistocene of Flores". Nature. 534 (7606): 245–248. Bibcode:2016Natur.534..245V. doi:10.1038/nature17999. PMID 27279221. ^ Kaifu, Yousuke; Kono, Reiko T.; Sutikna, Thomas; Saptomo, Emanuel Wahyu; Jatmiko, . ; Due Awe, Rokus (18 November 2015). Bae, Christopher (ed.). 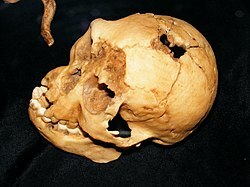 "Unique Dental Morphology of Homo floresiensis and Its Evolutionary Implications". PLOS One. 10 (11): e0141614. Bibcode:2015PLoSO..1041614K. doi:10.1371/journal.pone.0141614. PMC 4651360. PMID 26624612. ^ Tucci, S.; et al. (3 August 2018). "Evolutionary history and adaptation of a human pygmy population of Flores Island, Indonesia". Science. 361 (6401): 511–516. doi:10.1126/science.aar8486. PMID 30072539. ^ Callaway, E. (21 September 2016). 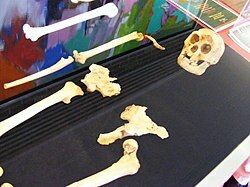 "Human remains found in hobbit cave". Nature. doi:10.1038/nature.2016.20656.